Feature Flags. Simple. Smart. Secure. A feature flags management service and API that doesn't require a tutorial for you to efficiently manage and deliver new features. Feature Flags will change the way your deployments are done by separating feature releases from code releases. Deploy your application and then, using the Feature Ops service, decide when and how to rollout or rollback features. Decoupling feature deployments from code deployments leads to less time, effort, and risk when it comes to deployments, and feature branching. A feature flags management service and API that is clean and intuitive to use. Turn on, turn off, target, and incrementally release features. Feature Ops API will instantly reflect the changes. Feature Ops has end-to-end encryption and does not require sensitive data. Learn more about Feature Flags and what Feature Ops can do for you. The important feature flags service traits without unnecessary and complex overhead. Add your features and adjust their availability in your respective environments. 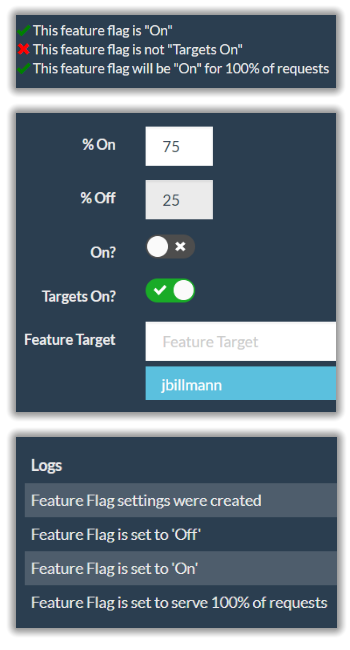 Create targets and rollout your features to a select bunch. Control your features from anywhere - desktop or mobile. Setup your DEV, UAT, and PROD environments and access feature flag settings for each. Control the percentage of users that will see new features. Feature Flag changes are logged for each environment. View metrics for feature flag requests. Use any language to connect to the Feature Ops RESTful API. Feature Ops SDKs, supporting multiple languages, with more on the way. Plans are designed to meet the requirements of both small and large. No credit card is needed to sign up and start playing. A technology company based in the beautiful mountains of Colorado. Copyright © 2017 Feature Ops LLC. All Rights Reserved.